The SSID (service set identifier) is the name of your wireless network. SSID broadcast is how your router transmits this name to surrounding devices. Its primary function is to make your network visible and easily accessible. Your router’s default SSID will usually include its brand name (e.g., Linksys or Compaq), but you can easily change it. Most routers broadcast their SSIDs automatically. To disable or enable SSID broadcast, you need to change your router’s settings. Just open your router’s control panel. You can do it via your web browser. Just type the router’s IP (located on the router or in your instruction manual) in the address field and hit enter. Then, enter the username and password (if they’re the defaults provided in the manual, this would be a good opportunity to change them). After opening your router’s control panel, find the wireless settings and find the SSID broadcasting option. By default, routers usually have this option enabled. What does a hidden SSID do? Disabling SSID broadcast will make your Wi-FI network name invisible to other users. However, this only hides the name, not the network itself. You cannot disguise the router's activity, so it can still be attacked by hackers. With your network invisible to wireless devices, connecting becomes a bit more complicated. Just giving a Wi-FI password to your guests is no longer enough. They have to configure their settings manually by including the network name, security mode, and other relevant info. Is disabling SSID broadcast a good idea? Disabling SSID broadcast only hides the network name, not the fact that it exists. Your router constantly transmits so-called beacon frames to announce the presence of a wireless network. They contain essential information about the network and help the device connect. For the same reasons, your device will still periodically broadcast its existence when you are outside of your router’s coverage area. This will show any hackers that are watching that you have a hidden network. As you cannot hide your router’s activity completely without turning it off, disabling the broadcast is a pretty superficial measure of security. Programs such as NetStumbler or Kismet can easily locate hidden networks. You can try using them yourself to see how easy it is to find available networks – hidden or not. Disabling your SSID broadcast could also raise suspicion. Most of us assume that when somebody hides something, they have a reason to do so. Thus, some hackers might be attracted to your network. 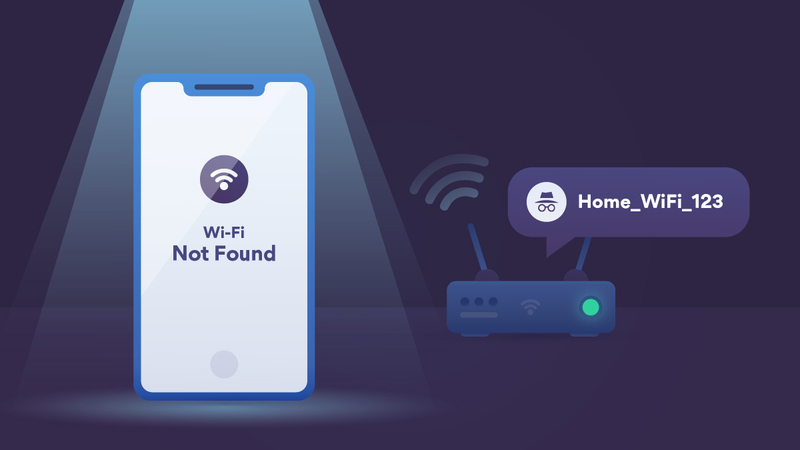 Disabling your SSID broadcast can disguise your network from inexperienced lay users, but it would do little against more determined and advanced baddies. Wireless security depends primarily on authentication and encryption. Disabling your SSID broadcast provides neither. Security through obscurity is a flawed solution. You can use these tips to help secure your WiFi or you can even set up a VPN on your router. The best option is to have a proper Wi-Fi Protected Access (WPA/WPA2, not the old-school WEP) password. Create a strong password to make sure it stays secure. Connecting to your network becomes more complicated. For more cybersecurity and privacy tips, subscribe to our monthly blog newsletter below!